Certain hydrangea (Hydrangea macrophylla) turn pink when grown in alkaline soil and blue in acidic soil. Since Dallas has alkaline soil, most of the hydrangea flowers in bloom here are pink. If you’re a Dallas gardener who likes to tinker with plant genetics, hybridization and other plant-changing techniques, try growing a hydrangea in acidic soil. In Dallas, hydrangea should be planted where it will receive early morning sun and afternoon shade. The Serrata species requires full to part shade all day. Water the hydrangea often enough to keep the soil moist but not drenched. Use caution when watering the clay soil that Dallas gardeners battle. It may appear dry on the surface, but it can be saturated further below. Use a steel rod or other device to drive into the soil to check for moisture. Apply a 3- to 4-inch layer of mulch around the base of the hydrangea. Mulch will help to conserve moisture in the soil on the dry, hot summer days in Dallas. It also discourages weeds that will compete with the hydrangea’s roots for water and nutrients. Fertilize in the spring using azalea food, according to the rate specified on the fertilizer package. Water the flowerbed before applying the fertilizer. 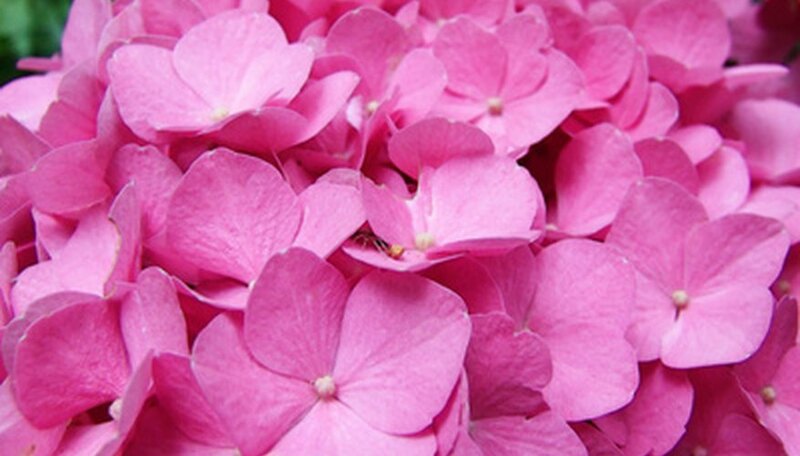 Change the color of your pink macrophylla hydrangea to blue by adding a 25-5-30 fertilizer that is low in phosphorus. Also, 1 tbsp. of aluminum sulfate diluted in 1 gallon of water, applied to the soil around the hydrangea twice during the blooming season will also help keep the Dallas hydrangea blue. Change the color of your blue macrophylla hydrangea to pink by adding dolomitic lime to the soil three or four times during the growing season. Scratch it into the top 3 inches of soil at the base of the hydrangea and use a 25-10-10 fertilizer in place of the azalea food. Deadhead the hydrangea to encourage more blooms by using standard gardening shears to snip the flower stalks close to the plant. Inspect the hydrangea periodically for powdery mildew. This is especially common in Dallas gardens with poor air circulation. Powdery mildew looks like a white or gray powdery substance, generally on the leaves but it can infest any part of the plant. Treat the hydrangea with a fungicide. Clean the garden bed in the fall by raking up all fallen leaves, flowers and branches. Apply a 3-inch layer of compost around the hydrangea and cover that with a fresh layer of mulch. Based in the American Southwest, Bridget Kelly has been writing about gardening and real estate since 2005. Her articles have appeared at Trulia.com, SFGate.com, GardenGuides.com, RE/MAX.com, MarketLeader.com, RealEstate.com, USAToday.com and in "Chicago Agent" magazine, to name a few. She holds a Bachelor of Arts in English with a concentration in creative writing. What Should I Do If I Accidentally Sprayed RoundUp on My Hydrangea?